We call Baltic States three countries east of the Baltic Sea: Estonia, Latvia and Lithuania. 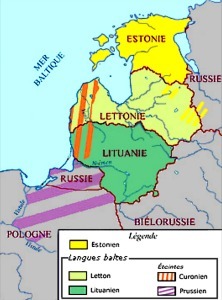 The word Baltic is used here on a geographical sense " bordering of the Baltic Sea " which concerns three countries, and not in the linguistic sense (Baltic languages which does not concern Estonia). In the XXIe century, the relations with Russia remain complex, three countries possess important Russian-speaking minorities (6 % in Lithuania, 35 % in Latvia and 25 % in Estonia). This minority, which sometimes suffers from exclusion, dread the integration to the European Union which she sees as an additional break with Russia, after the independence of 1990. Border disputes re-appear between Lithuania and Russia about the enclave of Kaliningrad and about the oriental borders of Estonia and Lithuania with Russia, but after all the current borders, stemming from the internal division of the USSR, eventually accept. Since 1991, the political will shared by these three countries is to turn the back on the Russian sphere of influence to anchor definitively the Baltic States within the European world. This was translated by the refusal to integrate Commonwealth of Independent States (CIS), structure swindles trained on ashes of the USSR in December, 1991, by the candidacy in a membership to the NATO, which comes up against a strong opposition of Russia, and by the candidacy to an European Union accession. Three Baltic States pronounced positively by referendum in 2003 on their European Union accession, which took place on May 1st, 2004. In 2003, three Baltic States are admitted as members of the European Union (with 7 other countries). They took their place from 2004 in the political authorities of the European Union (EU) and the NATO.